We’ve released three products today to help government deliver better online services and experiences. With the release of a redesigned dta.gov.au shopfront into beta, we’re making it easier for everyone to get help and advice. 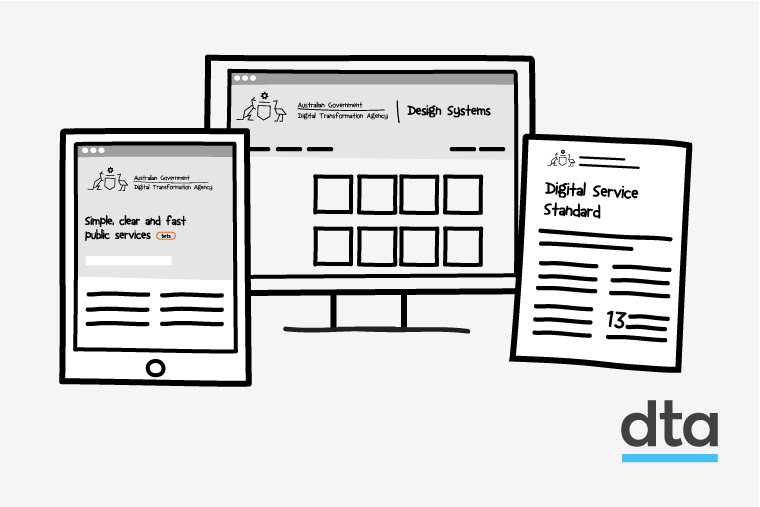 We’ve put a lot of work into this redesign, using the guidance it showcases including the new Australian Government Design System and refreshed Digital Guides. Our new information architecture will help you find guides and tools to build great services. This includes a new section about the ways you can get support for your project. We want to know your thoughts on the website and we’ll continue to add new content and features, using your feedback to shape our work. Along with the new site, there are 2 other tools and resources we are excited to release. The first is a world-class design system to help designers and developers deliver sites and services quickly and efficiently. This system has building blocks for teams, including design elements, open source code and explanations on how these can be deployed and customised. The second is our refreshed Digital Guides that will give you support to meet the Digital Service Standard. This includes more information on the service design process, putting together a team, understanding the people who use your services and how to develop a content strategy. The design system is a catalogue of code and detailed components that designers and developers can use to avoid reinventing the wheel on websites and digital services. It also supports a community where you can collaborate, share work, make improvements and solve problems together. We’re grateful for the ideas the community has already suggested to include in upcoming releases. The design system will help government create, test and release digital services more quickly to the people that need them. It will bring consistency, which helps users become familiar with their environment and complete tasks. And it’s a best-in-class example of making services available to everyone, baking in accessibility in preparation to meet new criteria in the international guidelines. Between this system and our secure, trusted and high availability platform cloud.gov.au, we’re making it easier to deliver services quickly. Our Digital Guides support agencies meeting the Digital Service Standard. The information can be used to meet best-practice, get buy-in for your approach, manage expectations and set your project up for success. These guides are based on user research with teams across government and input from digital specialists. More than 40 agencies brought their expertise and provided feedback to the content strategy tools and resources. These are also supported by the Content Guide, a resource on structure, style and accessibility developed with the help of our content community. There are large communities of practice with hundreds of members supporting and using these tools and resources. If you haven’t already, we encourage you to join them. We also need your feedback on these tools to shape future versions. These resources are living. As government and digital practitioners keep learning, there will always be new components to add, updates to make and insights to share. Stay tuned to our blog, Twitter and LinkedIn for updates.